The 2019 Kia Stinger is the new paradigm of gran turismo. From its fastback proportions and sculpted surfaces, to its driver-oriented interior and refined craftsmanship, the Stinger is uncompromising style designed for a spirited drive. 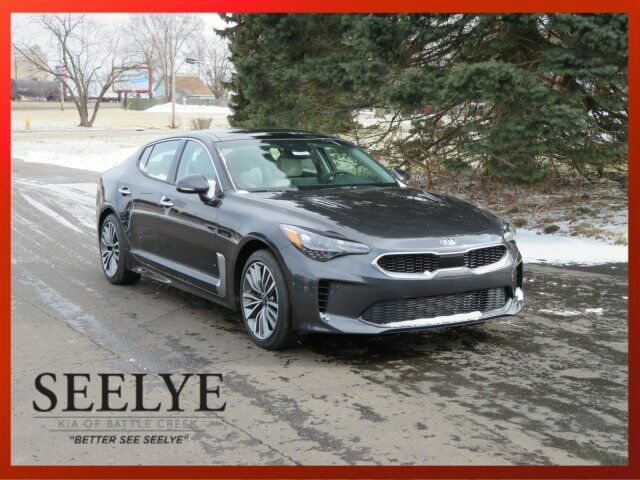 From its available high-glow LED headlights featuring distinctive jewel-like turn signals and standard LED daytime running lights to its sleek outside mirrors and four rounded exhaust pipes, this sports car makes a stunning first impression. The silhouette features a long hood, deeply-raked windshield and low-slung cabin, giving the appearance of motion even when still. And at the front, youll find Kias signature tiger-nose grille with distinctive honeycomb detailing. Take your pick between the 3.3L twin-turbo V6 engine or the 2.0-liter turbocharged 4-cylinder engine. Each paired with a gearing-optimized version of the next-gen 8-speed automatic transmission for fast, seamless shifting and decisive acceleration. The lightweight, 19in wheels are made to hug curves and turn heads. Not to mention with standard drive mode select, the system connects to the engine, transmission, suspension, and even steering to deliver five drive mode options. The Stinger is packed with cutting-edge technology, including a UVO app access, 7in LCD screen and shift-by-wire gear control. It also offers a suite of safety features, including cornering brake control, traction control, hill-start assist and antilock brakes.